Got a kid who loves to cook? Lucky you! Lucky kid! As the holidays draw closer, it’s time to bring out our annual Great Gifts for Kid Chefs list (don’t forget these Kid Chef Gifts from 2010 and Kid Chef Gifts from 2011). 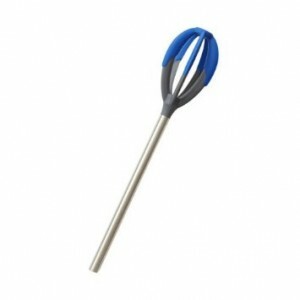 Spatula Whisk: Your kid chef can get two jobs done with this handy little tool: It whisks AND scrapes out your bowl. It’s heat- and dishwasher-safe. Added bonus: It comes in a bunch of fun colors too. Fred Batterfinger Spatula: This one is so goofy we couldn’t resist. Perfect for scraping up those last bits of frosting or cookie dough, this cartoonish finger gets the job done. Duck Snippers: If you’re not ready to bring out the knives just yet, get them started on … snipping. For your little kitchen helpers, it doesn’t get cuter than these Kuhn Rikon Kinderkitchen Duck Snippers (say that 10 times fast). The blades are sharp enough to cut herbs and veggies, but rounded enough not to hurt people. Oven Mitts: Adult-sized oven mitts can be too big (and therefore dangerous) for smaller hands. Give your kids a leg (hand?) 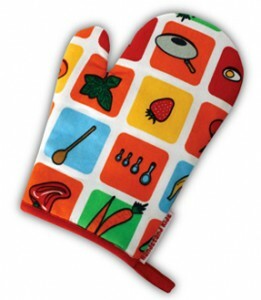 up on kitchen safety with this kid-sized oven mitt from Handstand Kids (love the fruit and veggie print theme…). 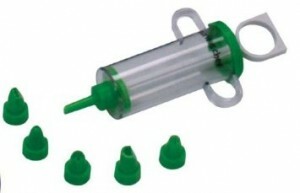 Decorator Set: Sure, you can decorate cakes or cupcakes with frosting, but why limit yourself? With this decorator set from Curious Chef, your kid can add sauces, condiments, garnishes, or pastes to his heart’s delight. 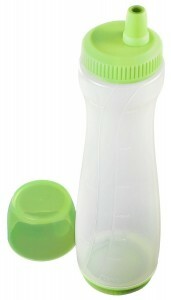 Bonus: It’s sturdy and dishwasher-safe. 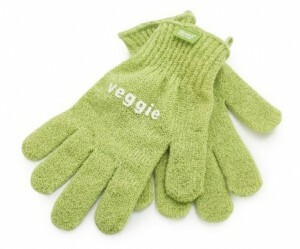 Veggie Scrub Gloves: How cool would it be to put even the littlest tots to work in the kitchen with a tool that makes chores more fun? These Danish-made Fabrikators Veggie Skrub’a Gloves let your kids scrub veggies clean (while keeping the nutritious peels intact). Sit your kids down with a pile of potatoes and you won’t hear from them for another 30 minutes. 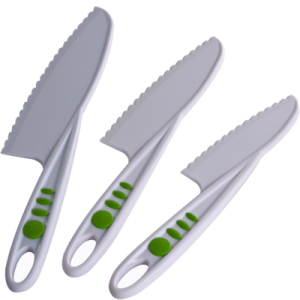 Knife Set: We’ve said it before, and we’ll say it again – Teach your kids good knife skills. If they know what they’re doing, they’re much less likely to hurt themselves with a knife now or later on down the road. Get them chopping with this nylon, kid-friendly knife set from the Curious Chef. Pancake Pen: Even if you just use it on Saturday mornings, this pancake pen from Tovolo is a fun addition to your kids’ cooking repertoire. Mix up your batter and shake it all in the jar, and then squeeze it for perfect pancake shapes, letters, numbers…anything you want to create. The pancake pen actually makes it easier and neater to make cool pancakes. Cookbooks: Last but not least, you’ll want a little inspiration to get cooking. For the younger set, we love Mollie Katzen’s classic Pretend Soup and Other Real Recipes (each recipe is shown in picture form as well as written form to encourage independent young cooks). For older kids, we’ve been consistently impressed with Eat Fresh Food – it has gorgeous pictures and easy-to-follow recipes, many of which are vegetarian or vegan.